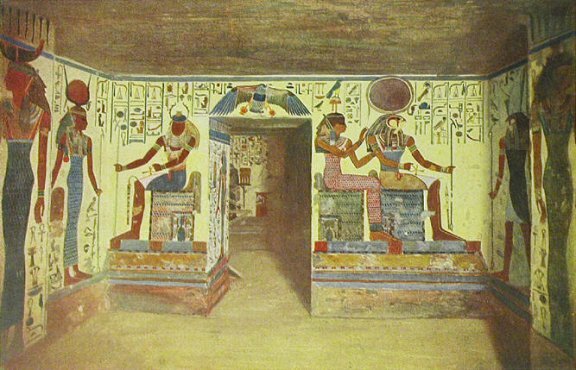 Queen Nefertari being met by Neith and Selkis. Neith and Selkis the two Goddesses, are both clad in fine red dresses. They are standing to receive the queen as she enters the side-chamber. On the right, the queen is seen led by Horus to Harmachis and Hathor, enthroned. On the left Isis leads the queen forward to Khepra, the beetle-headed God of the Resurrection.